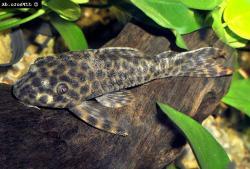 Identification An inconspicuously coloured small catfish which, with its compact body shape, reminds one mostly of 'classic' Peckoltia, from which it is nevertheless differs by its almost straight head profile. Further differences from 'classic' Peckoltia are a very large gap between the eyes, which is around one fifth of the body length (in Peckoltia less than one sixth) and a very domed and furrowed head area. 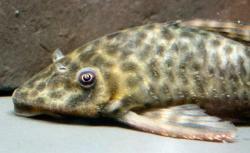 Because of these differences it was briefly classified in a new genus (Sophinancistrus), however now resides back in Peckoltia. Sexing Unlike other Peckoltia the males of this species don't grow permanent body odontodes. 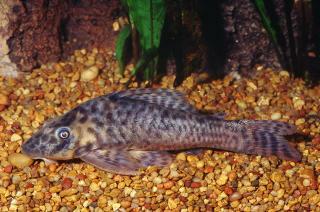 They do grow short odontodes on their caudal peduncles. 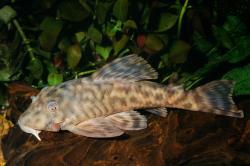 It seems, however, that they only do this when they are well conditioned and it is their spawning period. The rest of the time, they are unadorned. Females have a wider girth across the body most evident when the area just behind the pectoral fins is viewed from above on well conditioned individuals. Distribution Widespread throughout upper Amazon. L232 - Peru (exported from Iquitos but collected at Putumayo on the Peruvian / Colombian border). From Armbruster's Peckoltia revision: The specimens I have collected appear to have been chased from the middle depths of submerged grasses and twigs as the seine was not fully on the bottom. This suggests that the hypertrophied pelvic muscles and widened pelvic-fin spines may be used to grasp the grasses and twigs.